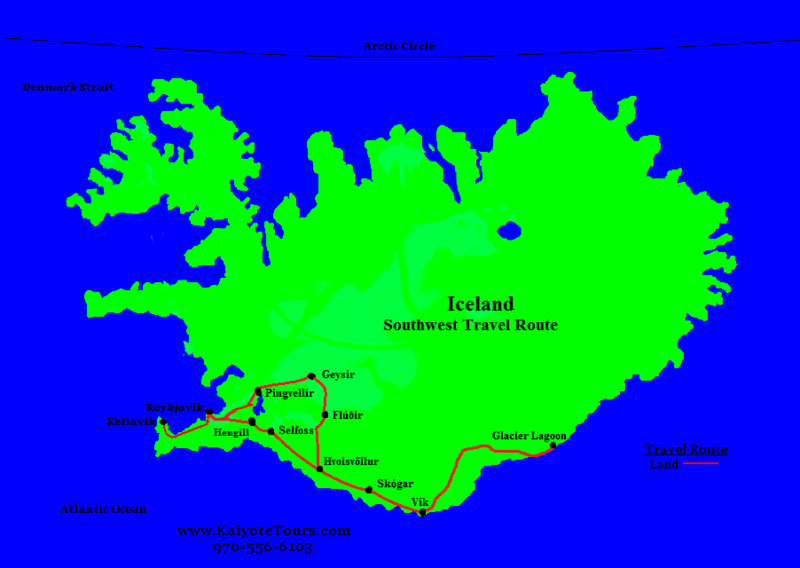 If you are interested in Birding Southwest Iceland Tour, come and join us at Kaiyote Tours! Please join us! You will see and experience amazing waterfalls, glaciers, volcanoes, fantastic birding, eating at the finest restaurants in Reykjavik, walking the incredible landscape of this amazing island, soaking in natural thermal hot springs, sleeping at great hotels, snuggling in cozy cabins, Nordic shopping, Icelandic horses and charming Vikings! We start out this 10-day trip in Reykjavik. This is a great area for birding, walking the coastal route, art and culture. The next five days we will be taking a road trip along the Southwest coast. This area has amazing waterfalls, a stunning coastline and great hiking trails. We will spend our last day back in Reykjavik. Flights are usually overnight with early morning at the Keflavik International Airport (KEF). It is a 45-minute shuttle ride to Reykjavik from the airport. There are many great and interesting lodging places in downtown Reykjavik... we have many favorites. Breakfast is a traditional Icelandic offering of fish, cheese, meats, breads, cereals, etc. In Iceland the hot water is all from the thermal heat coming from the ground, so there is always plenty of hot, hot water and sometime it smells a little like sulfur. Common birds to be seen: Eurasian Blackbirds, Redwings, Ravens and Common Redpolls. Reykjavik is the capital of Iceland and is rich in maritime history and close to numerous geological wonders. Options for today are hiking along the peninsula, birding and checking out the shops and museums of Reykjavik. In the harbor and along the peninsula birds like Northern Fulmars, Gannets, Shags, Common Eiders and Long Tailed Ducks are a few of the species we will see. Today we will be visiting Thingvellir National Park, Gullfoss and Geysir. There is a lot of great hiking in these areas and amazing rivers and waterfalls to see. Lodging is at local farm stay or B&B. This area is where a lot of Icelandic Horses graze and horseback riding is an option, but not included in the tour price. Today you will have a choice of either birding in the Haukadalur Forest or horseback riding on the beautiful Icelandic horse. Just outside of Geysir are the Haukadalur woods, which is one of the largest forests in southern Iceland. We will be exploring this forest for birds and interesting sights. From here it is a short and wonderful drive to the town of Flúðir where will be staying at the Flúðir Hotel. The Flúðir has a very nice hot springs tub garden. Dinner will be at the hotel. It is a beautiful drive from Flúðir to the stunning waterfall named Seljalandsfoss; many stops and birds to see. This is one of the most beautiful areas in Iceland. We will visit the Eyafjallajökull (just say the E-15) volcano and traveling through the amazing valley below the glaciers. In the evening we will be taking a 30 minute ferry ride to Vestmannaeyjar and staying on Heimaey Island. This area is one of the best birding spots in southern Iceland and here is where we will see lots of puffins and other seabirds. In the morning there will be time for walking and watching birds on Heimaey Island. In the afternoon we will be driving to the seaside town of Vík with plenty of stops along the way to see this beautiful coastline and look for birds. We will be staying at the Hotel Edda which has cabins just up the hill where we will be staying for the night. Dinner will be at a local restaurant in Vík. We will be spending the day wandering and exploring the Vik coast. There are amazing cliffs and rocks along this southern coast. This area also has beautiful sand beaches where Puffins and Oystercatchers can be seen in the coves. We will hike to the top of the Skógar waterfall and beyond towards the saddle between the Eyjafjallajökull and Katla volcanoes. In the afternoon we will be driving to Selfoss and staying at the Gesthús. The Gesthús is a camping area that also has small individual cabins that have nice bathrooms (plenty of thermally heated hot water) and kitchens. The cabins are tucked away in a small pine tree grove. The cabins are at the edge of the town of Selfoss and close to everything. It is very peaceful and cozy there. In the morning we will be visiting the wonderful and amazing thermal pool called the Blue Lagoon for a swim and a soak. We will be staying at the edge of the Reykjanes peninsula which is an excellent birding location with numerous geological sites.